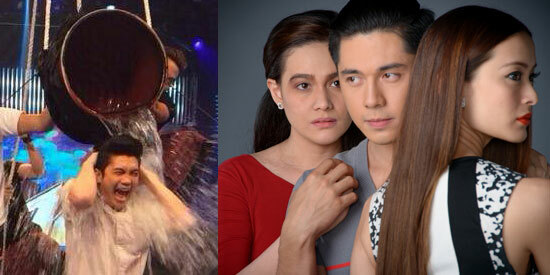 Vhong Navarro (left frame) took the ALS ice bucket challenge live on It's Showtime; Sana Bukas Pa Ang Kahapon is topbilled by (L-R, right frame) Bea Alonzo, Paulo Avelino and Maricar Reyes. ABS-CBN's primetime programming continues to gain loyal viewers. This is according to data based on the overnight ratings of Kantar Media/TNS among Total Philippines (Urban & Rural) on August 18-24, 2014. Two Kapamilya primetime shows took turns on top during the given period. Ikaw Lamang's Book 2 was the most-watched show on August 18 and 19. The drama series stars Kim Chiu, KC Concepcion and Coco Martin. Hawak Kamay was the winner on August 20 and 21. The primetime program stars Piolo Pascual, Iza Calzado and Zaijian Jaranilla. Sana Bukas Pa Ang Kahapon, starring Bea Alonzo, Paulo Avelino and Maricar Reyes, has consistently beaten its rival in the primetime block. The ABS-CBN teleserye is pitted against the Dingdong Dantes-starrer Ang Dalawang Mrs. Real. ABS-CBN is also victorious during daytime; Be Careful With My Heart and It's Showtime have the most viewers daily. The noontime show, It's Showtime, was able to consistently beat its counterpart program Eat Bulaga! During this period, the reality show Pinoy Big Brother All In ended with a big bang. Its Big Night on August 24, Sunday, and scored 27.9%. PBB All In's finale beat the debut of GMA-7's Sa Puso ni Dok, which only scored 9.8%. Sa Puso ni Dok is a weekly medical drama that stars Dennis Trillo and Bela Padilla. The Kapamilya Network was also the winner on August 23, Saturday, with Maalaala Mo Kaya: Ang Tahanan Mo in the lead. The episode featured Pokwang and Enchong Dee as an impoverished mother and son. Here are the comparative Household Ratings of ABS-CBN, TV5, and GMA-7 programs from August 18-24, 2014 based on the overnight ratings of Kantar Media/TNS among Total Philippines (Urban & Rural) households.